Texas Voter ID Law Goes To Trial : It's All Politics A federal court will hear a challenge to the controversial law next week. It's an important and closely watched voting rights case that could end up before the Supreme Court. A voter in Austin, Texas, shows his photo identification to an election official in February. Texas' Republican-controlled Legislature passed new photo ID requirements for voters back in 2011. Supporters said the law was needed to prevent voter fraud, although opponents noted that there was little evidence of such fraud at the polls. At the time, the state was covered by Section 5 of the Voting Rights Act, which meant it needed federal approval for the law to go into effect, because the state had a history of discrimination against minority voters. The case ended up before a three-judge federal court in Washington, D.C., which in 2012 ruled against the state. It said Texas could not impose the new ID requirement, because the state was unable to show that it would not discriminate against blacks and Latinos. Under Section 5, the burden of proof was on the state to show that the law was nondiscriminatory. Fast-forward to 2013, when the Supreme Court issued a landmark decision invalidating Section 5 of the Voting Rights Act. Within hours, Texas officials announced that they would start implementing the ID requirements. Opponents then decided to challenge the law using some new tools — another section of the Voting Rights Act (Section 2), and the U.S. Constitution. Which brings us to the current case in Corpus Christi. It pits the U.S. Department of Justice, the NAACP Legal Defense Fund, the Mexican American Legislative Caucus, numerous Texas voters and others against the state. The groups argue that the law discriminates against black and Latino voters, because they're less likely to have the required photo ID, which includes things such as a valid driver's license, passport or concealed handgun license. They'll also argue that these voters are more likely to be poor, which means additional burdens. Attorneys for the groups say they'll cite the cost of documents needed to get the ID, such as a birth certificate, and the fact that many low-income voters have a hard time getting off work to travel long distances to state offices where the ID is available. The state, for its part, argues that the law is needed to instill confidence in the electoral system, and that there are indeed some cases of fraudulent voting. In its court filings, the state also contends that there is no evidence the law has prevented or will prevent any eligible voter from voting, and that there was no intent to discriminate against blacks and Latinos. The difference between this case and the one before the federal court in 2012 is that now the burden of proof is on the law's opponents. Still, they think they might have an advantage. The case is being heard by U.S. District Judge Nelva Gonzales Ramos, who was appointed by President Obama. But the voter advocacy groups also know — if they prevail in her court — the state will almost certainly appeal the decision to a federal court with a more Republican tilt. The state wants to keep the ID requirements in place for this November's election. 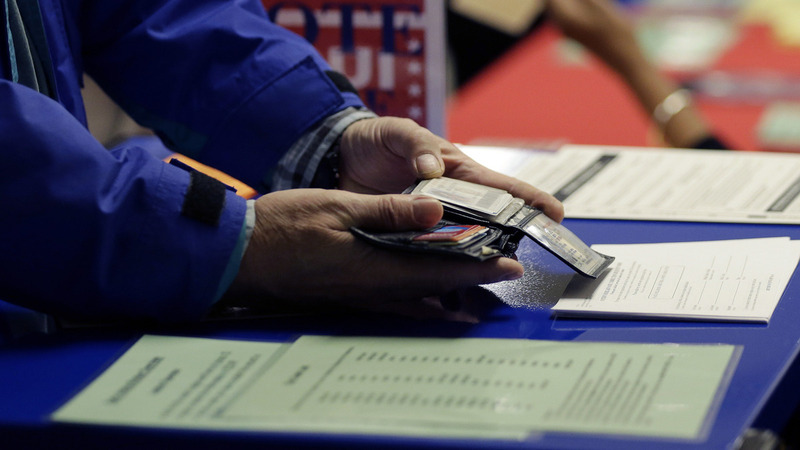 All this is important, says Edward Foley, an election law expert at the Moritz College of Law at Ohio State University, because there are similar voter ID laws being challenged or considered in other states, including North Carolina and Wisconsin. Those involved are watching this case to see how effective Section 2 of the Voting Rights Act will prove to be in the fight against such laws. "That's a major, major issue," says Foley. "All states are bound by the obligation not to impose a discriminatory burden on voting rights on the basis of race, and so if a voter ID law [is found to have imposed] that burden ... that would be very significant new voting rights law." Foley says it could be applied not only to ID laws, but to other things such as cutbacks in early voting. He and other experts think the issue might very well end up before the Supreme Court.